What They Say.....After a failed apprenticeship, working her way up to head housekeeper of a posh London hotel is more than Sara Smythe ever thought she’d make of herself. But when a chance encounter with Theodore Camden, one of the architects of the grand New York apartment house The Dakota, leads to a job offer, her world is suddenly awash in possibility—no mean feat for a servant in 1884. The opportunity to move to America, where a person can rise above one’s station. The opportunity to be the female manager of The Dakota, which promises to be the greatest apartment house in the world. And the opportunity to see more of Theo, who understands Sara like no one else . . . and is living in The Dakota with his wife and three young children. In 1985, Bailey Camden is desperate for new opportunities. Fresh out of rehab, the former party girl and interior designer is homeless, jobless, and penniless. Two generations ago, Bailey’s grandfather was the ward of famed architect Theodore Camden. But the absence of a genetic connection means Bailey won’t see a dime of the Camden family’s substantial estate. Instead, her “cousin” Melinda—Camden’s biological great-granddaughter—will inherit almost everything. So when Melinda offers to let Bailey oversee the renovation of her lavish Dakota apartment, Bailey jumps at the chance, despite her dislike of Melinda’s vision. The renovation will take away all the character and history of the apartment Theodore Camden himself lived in . . . and died in, after suffering multiple stab wounds by a madwoman named Sara Smythe, a former Dakota employee who had previously spent seven months in an insane asylum on Blackwell’s Island. One hundred years apart, Sara and Bailey are both tempted by and struggle against the golden excess of their respective ages—for Sara, the opulence of a world ruled by the Astors and Vanderbilts; for Bailey, the free-flowing drinks and cocaine in the nightclubs of New York City—and take refuge and solace in the Upper West Side’s gilded fortress. But a building with a history as rich—and often tragic—as The Dakota’s can’t hold its secrets forever, and what Bailey discovers in its basement could turn everything she thought she knew about Theodore Camden—and the woman who killed him—on its head. 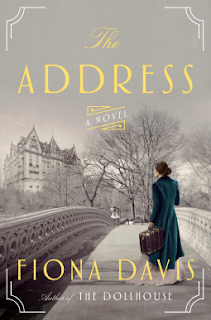 With rich historical detail, nuanced characters, and gorgeous prose, Fiona Davis once again delivers a compulsively readable novel that peels back the layers of not only a famed institution, but the lives —and lies—of the beating hearts within. What I Say.....I enjoyed The Dollhouse so I was really excited to get an advanced copy of The Address. I always like historical fiction, and although it started a little bit slow, I was engrossed pretty quickly. Bailey is desperate for money and a place to live, so she takes up residence at The Dakota, a historic apartment building - at the beck and call of her party girl "cousin, Melinda. Although they aren't technically related, they have a family bond, and right now Melinda is the only one who will give her the time of day. Even though Bailey does't agree with the design style Melinda is leaning towards (could anyone's taste really be that bad? ), she knows she is in no position to argue - and kowtowing to Melinda has been a constant in Bailey's life since they were children. There was the time hop story between the past and the present, and if I had one complaint - it would be that the present story wasn't nearly as compelling as the past. Part of the was that i didn't really find Bailey to be that likable, and the romantic storyline was almost sterile in tone. I cared much more about Sara and her story, and wanted to know how she ended up in an asylum and known through history as a murderess.